2012’s “The Watch” sucked. That’s all I’ve got. It sucked. By all means, keep reading though. I enjoy writing reviews for movies that were God awful as much as the ones I loved, maybe more so. Go figure. Having lived his whole life in Glenview, Ohio, Evan Trautwig (Ben Stiller) does his best to give back to the community, starting clubs and events to bring people together. His polite, little world is thrown for a loop though when a night security guard at the Costco he manages is found brutally murdered. 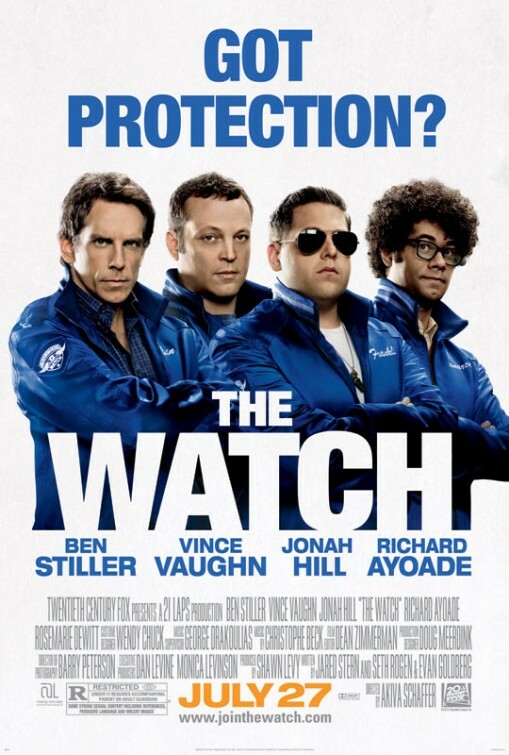 He decides to do something about it though, starting a Community Watch with three other Glenview residents, Bob (Vince Vaughn), Franklin (Jonah Hill) and Jamarcus (Richard Ayoade). No one in town thinks much of this group — what can they actually accomplish the cops can’t? — and when they can’t manage to find do anything right, that thought seems pretty fair. Then one night durng a patrol around town, the Watch finds something none of them expected…..an alien! Oh no! What to do?!? Thanks to marketing, some horrifically bad timing, and in general, a pretty checkered production, this is a flick that could have been doomed from the start. Countless directors, writers and stars were at one point on-board before Seth Rogen and Evan Goldberg were brought on board to write a harsher, R-rated comedy. 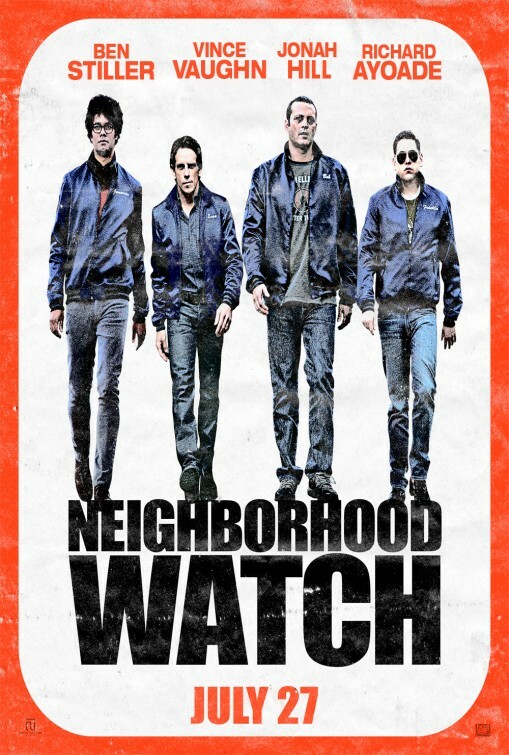 Then in February 2012, a Neighborhood Watch member shot a teenage boy, setting off a torrent of reactions on both sides, and eventually changing the original title, “Neighborhood Watch”, to just “The Watch”. Then, in Colorado in the weeks before its release, a mass shooting at a movie theater clearly had an impact on audiences going out to see any films. Whatever led up to the film’s release though, it’s hard to look past the fact that this is one stupid movie that just isn’t very good. So before I continue, I’ll say that for the first 15-20 minutes of this flick, I was enjoying it. It had that right mix of humor (both smart and stupid) and was at least laying the groundwork for a funny movie. Then, everything hits the fan in a big old way, and I’m struggling to come up with one specific reason why. One, it simply tries too hard. The cast assembled has a ton of talent. The laughs and humor don’t have to be aggressively thrown in our face. Instead of just being funny though, the laughs are loud, overdone and in most cases, settling for the lowest common denominator. “Oh, Jonah Hill is crazy and swears a lot!” Two, it doesn’t know what it is by any means. As Evan and the Watch investigate a freaking alien appearing, the story veers off into the personal. We learn that Evan is sterile, but hasn’t told his wife (Rosemarie DeWitt). Bob’s daughter (Erin Moriarty) intends to hook up with an all-around a-hole, and Bob intends to stop her. Who cares? It’s an R-rated comedy, let’s not get all after school special on the viewer. Not so surprising, the script relies heavily on the four stars to lead the way with mixed results. With the right role, Ben Stiller can be a pretty good actor, usually playing the straight man to the hijinks all around him. This is almost that part, but not, as he’s the straight man who….has to act crazy too? Vaughn gets most of the big laughs, but he resorts too much to LOUD Vince Vaughn, talking so ridiculously fast and ranting that it feels like we’ve seen it before in countless other movies. Hill is just bad as Franklin, the unhinged nut who is willing to do anything and everything to help the cause, but mostly he just wants to have some messed-up fun. 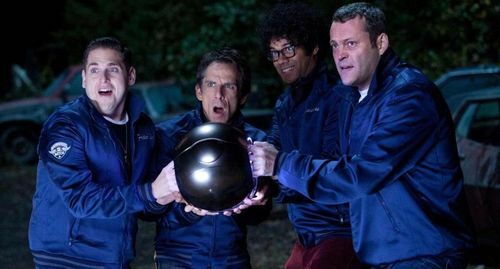 The bright spot is Ayoade as Jamarcus, the quiet, nerdy guy who seems like the odd duck in the group. It works though because his laughs are usually underplayed and/or understated. Also look for Billy Crudup in an uncredited part as Evan’s suspicious neighbor across the street, Will Forte and Mel Rodriguez as two local cops having fun messing with the Watch, R. Lee Ermey as a pissed off neighbor, and The Lonely Island crew, Andy Samberg, Jorma Taccone, and Watch director Akiva Schaffer making a cameo at a party Evan and Jamarcus stumble into. Through all the stupidity and mindless humor, there were bits that worked here. Unfortunately, most of those bits were shown in the trailer so they don’t come as a surprise. The Watch taking some pictures and having some generally chaotic fun with a supposedly dead alien is hilarious and Evan and Bob endlessly shooting another dead alien later is funny in an odd, subtle but not subtle fashion. In the end though, things fall apart as several twists are thrown our way that don’t add up. The humor gets even more juvenile – if that was possible – and just ends up trying far too hard to impress us as viewers and get a laugh.